What’s up, you holiday hos? Just like Daylight Saving Time, Saint Patrick’s Day is one of those calendar-related events that I go along with every year but don’t really know why. Does it benefit society in some way? Probably. Do I know the cultural significance? Absolutely not. That won’t stop me from imbibing ye olde green beer (or three) and stealing someone’s ugly holiday hat whilst drunk (and later throwing up into said hat). Tired of all those mass-produced Kelly-green shirts (the worst colour for ANY skin tone)? Take a skim down my list to see what you should be sporting this Saint Patrick’s Day! He was like, a saint, right? I think all saints weren’t allowed to wear anything cute because, you know, they were hanging out with Jesus and stuff. Imagine if you showed up to the last supper with, like, a little red feather behind your ear, and then you looked better than Jesus at his last supper? No way! Grab a sack, but don’t forget to highlight your trim waist with a little piece of frayed rope. Bonus points if you grow out your hair long enough to wash Jesus’ feet. I think S.P. played a flute to chase all the snakes out of Ireland? I feel like “snakes” might be code for something more nefarious, but I like to pretend everyone just had a massive snake infestation and he swung in and was like, “Guys, I got this.” Honour his awesome pest control skills by dressing up like a big snake. Bonus points—stash beer in your snake tube! See, this is where it gets tricky. 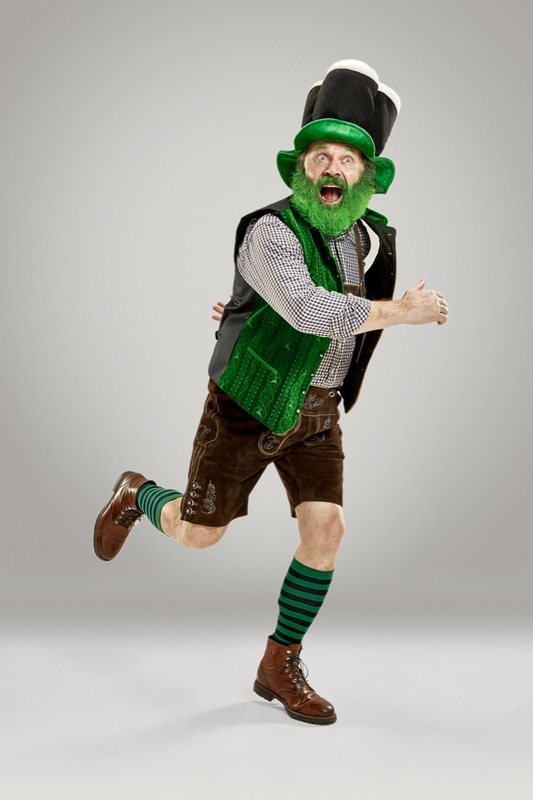 I feel like a leprechaun costume is kind of… cultural appropriation?! Or at least not okay on some level. Still though, how hilarious would it be to see someone go all-out on a leprechaun outfit with belt-buckle shoes and an Austin Powers neck ruff. Pantaloons, too! A classic for the ages. If I had one of these shirts, I feel like I would wear it multiple times a year. You could dress it up (tuck it into a skirt), dress it down (tuck it into jeans), or dress it really down (Winnie the Pooh style, shirt and no pants). Also very, very funny if you are clearly not Irish like me. You’ve seen those, right? They’re basically giant curly wigs (think Toddlers & Tiaras size) that, in contexts outside of Irish dancing, look pretty wild. Throw on your best duds, then top it off with one of these 10-pound monstrosities and hit the club. Fellow partygoers won’t be able to keep their eyes off you!